Back in March I blogged about starting my own personal GBBO challenge – where I would try baking a new recipe once a fortnight. I’ve pretty much stuck to it, although sometimes I’ll confess there may well of been more than a fortnight in-between. There have been some successes and failures along the way, one bake that really didn’t go well was my madeira cake, but practice makes perfect. A couple of weeks ago for the first time I made choux pastry, I’ve always avoided it as I thought it was really complicated (plus my auntie is the queen of profiteroles so I’ve never really had the need!). I couldn’t believe how simple it is, and how easy it was to get great results. I made six large choux buns which I then piped full of a rapsberry and vanilla cream – topped with more fresh berries. They went down a storm with the husband. This weekend, (following the Great British Bake Off) it’s all about bread, which considering my background I probably should of covered first. For those that don’t know me, bread and baking is in my blood. My grandfather owned a successful bakery business until he retired around 15 years ago – and he was the third generation of his family to own a bakery business. We all worked at the family business at some point, I used to work every Saturday morning in one of the shops he owned (which was great as a teenager as I had an unlimited supply of donuts for my friends after our trips to the local pub on a Saturday evening). When my brother and I were small we used to ‘help’ out in the original bakery that he owned and he always told us we were natural kneaders. I really must get him to write down all the bread recipes he used to use as I’ve never found any supermarket bread that tastes as good. So, this weekend I’ll be trying out the perfect white loaf recipe from my Bake Off book. Whether I show my grandad the end result or not will depend on what it looks and tastes like! 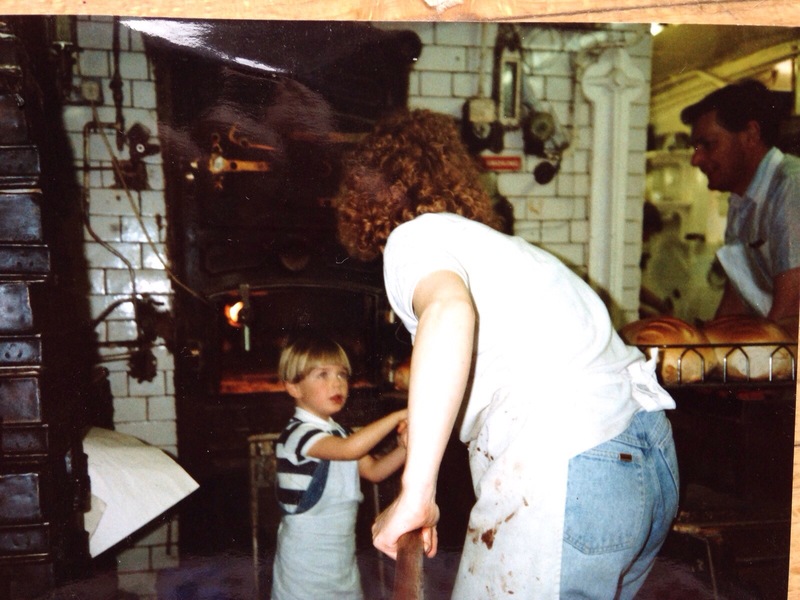 My little brother helping out at my Grandad’s first bakery – which had a traditional bread oven. This entry was posted in Baking and tagged bakery, baking, bread, great british bake off, home, new challenge. Bookmark the permalink.